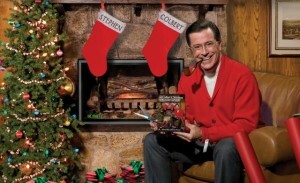 Stephen Colbert is getting ready to leave his mountain lodge to film his Christmas Special when he discovers that there is a bear outside, and he can’t leave. While plotting how to get out he is visited by various musical guests who sing fantastically inappropriate Christmas songs. Toby Keith sings a song about the war on Christmas where he implies that Uncle Sam and Santa are one in the same; John Legend sings a sexual song about nutmeg, at one point saying that “The only residue I want you wiping off your face is my nutmeg”; and Feist sings an angelic song asking a praying Stephen Colbert to “please be patient” since the angels are busy this time of year. There are also songs by Stephen Colbert, Willie Nelson, Elvis Costello, and Jon Stewart. There are plenty of things that will make you laugh, turn your head in disgust, and leave you speechless. Everything was over-the-top in traditional Stephen Colbert fashion, and this 45-minute special was well worth the viewing, although it won’t get a spot on my Christmas must-see list. So if you are looking for a good laugh when this stressful time of year has got you pulling your hair and screaming at everyone, consider watching this and remember that at least you’re not stuck in a mountain lodge with Stephen Colbert. 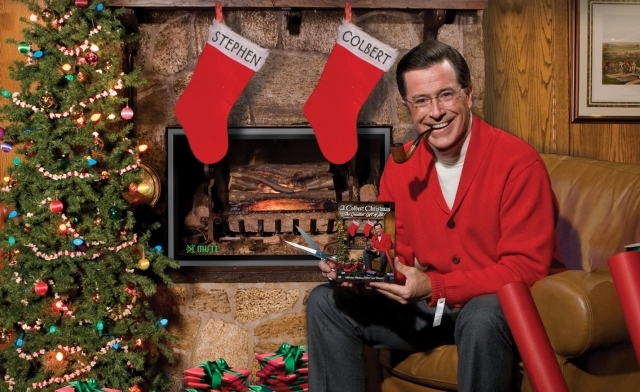 BTW: The DVD contains bonus material including a Yule Log Book Burning, which is a video of books being burned (near the end of the video a copy of Fahrenheit 451 is clearly thrown into the fire), alternate endings, an advent calendar, and a bonus country Christmas song by Colbert. I spent almost this entire special staring stupidly and saying, “I…I don’t even know what to DO with this!” Also, for some reason a throw-away gag about a Land Mall catalog (a take-off on the Sky Mall catalog I always read on planes) was what finally made me laugh out loud. That’s not what people normally say.